I have lived in Louisville for over three years now. Yet, this weekend was the first time I have been to the Louisville Slugger Factory and Museum. As an avid baseball fan, I am a little ashamed of that. In my defense, I have been to several Louisville Bats games. We had a great time at the museum. It was my dad, Jen, my friend Bryan, and me. When you purchase a ticket, it has a time for the factory tour. While waiting for your tour to begin you are able to walk around the museum, which was super cool. They have bats in the museum from Babe Ruth, Honus Wagner, Joe Tinker, Shoeless Joe Jackson, Ken Griffey Jr., Cal Ripken Jr, and many others. After looking around the museum, the tour guide called for our 2:15 tour. The beginning of the tour included a video talking about the trees used to make the bats, which were white ash and maple from forests in New York. They made a big point to say that these forests are in great shape, and more trees are planted every year than are harvested. I think they said they get around 60 bats per log. Next, the tour went to a guy at a lathe. He talked about the history of Louisville Slugger. 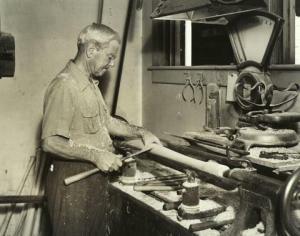 Up until 1980, each bat was made personally at a lathe. Each bat took around 30 minutes to make. 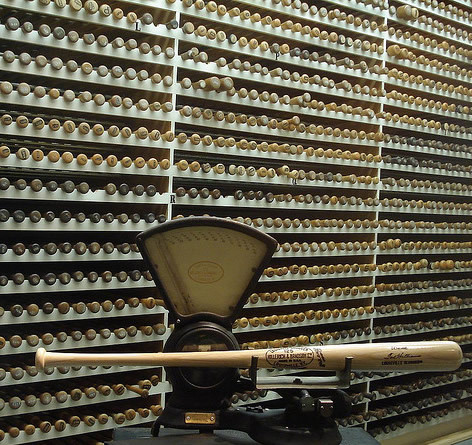 The batmaker would receive an order from a player (like Lou Gehrig or Ernie Banks), he would go to the bat vault (which I wish I could step in there for 5 minutes!) and get the master copy of that player’s bat. Then, he would carve a new bat based on the master. The next section of the tour introduces you to modern bat-making. There are machines that crank out commercial Louisville Slugger bats every 30 seconds. These automatic lathes were very impressive. Then, they showed us the machine that makes the MLB bats. It looked like that cylinder in the old Hulk movies in which Bruce Banner transformed. They also had some MLB players bats you could handle. I was excited to hold one of Starlin Castro’s bats. 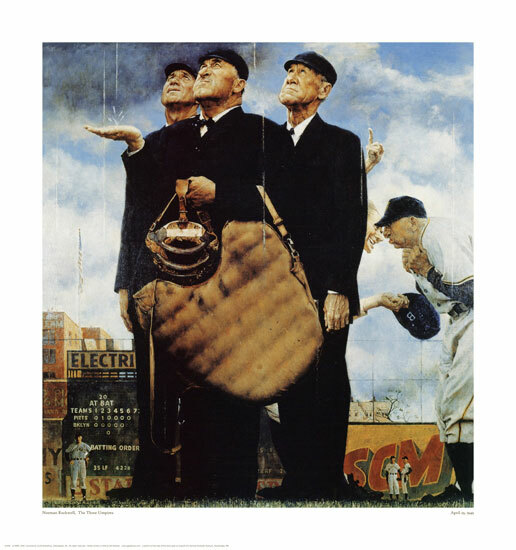 After the tour, we enjoyed visiting the Norman Rockwell exhibit they are currently featuring. It had a cool video about Rockwell, as well as several original sketches and paintings. I really enjoyed seeing the original sketch of a game called due to rain. 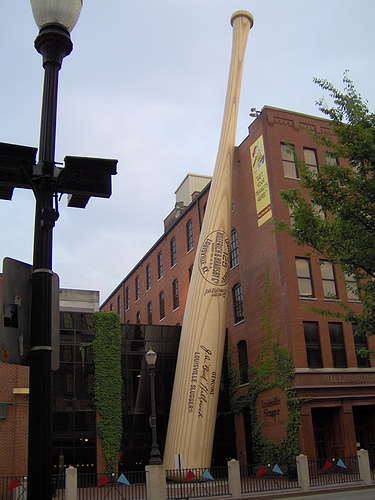 So, if you ever come to visit Louisville, I heartily recommend the Louisville Slugger Museum and Factory. Tell ’em For Aslan sent you, and maybe they’ll cut me a deal on a sweet bat or let me in the bat vault. WHAT A GREAT WAY TO TOP OFF YOUR DREAM BASEBALL TRIP THIS SUMMER WITH DAD. 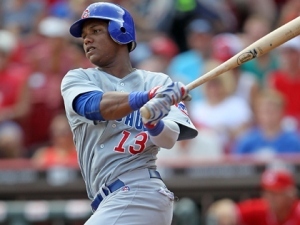 MAYBE COOPERSTOWN IS NOT TOO FAR OFF FOR YOU AND DAD. That’s a great place. I’m not sure I liked your tone on the Ortiz comment, but nonetheless, I’m glad you finally visited there. I just find it odd that they put in a bat of a still-active player, whilst the rest are hall-of-fame guys. Ortiz is legit, I just don’t know if he’s on the same level as those guys.